Making a healthy and delicious dinner doesn’t have to be time-consuming and difficult! While it may be easier to order a pizza, cooking dinner is a great way to be more aware of what you are eating and can be a fun bonding time for your family. I make so many meals that are simple and delicious! This is one of my dinner recipes that my kids and I absolutely love! 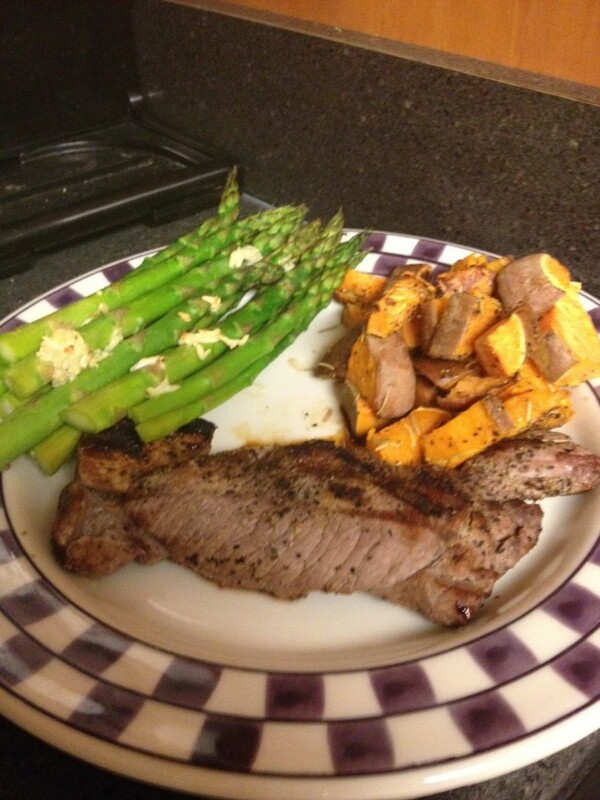 It is grilled venison, rosemary sweet potatoes, and roasted asparagus. It is super simple, super tasty, and made with superfoods (asparagus and sweet potatoes). You can try this simple recipe by following the directions below! While I have the rosemary sweet potatoes recipe in another blog, I will add it here again so you don’t have to switch back and forth. This recipe is easy and great to use as a side for any meal! If you are looking for a healthy side dish, try out this sweet potato recipe. 1. Dice the sweet potatoes into bite-sized pieces. 2. Drizzle the sweet potatoes with olive oil and sprinkle with black pepper, sea salt, garlic powder, rosemary, and thyme (thyme is a strong herb so use sparingly). 3. Bake the sweet potatoes at 400 degrees for about 30 minutes or until the potatoes are no longer crunchy. Yup, it is that simple! While these bake, you can make the rest of this dinner. You can also use this sweet potato recipe for many other meals! To make this asparagus, I used my favorite “death by garlic” recipe! 🙂 It is delicious and super simple. 2. Lay the asparagus on the cookie sheet and spread it out evenly. 3. Drizzle the olive oil over the asparagus and sprinkle with garlic powder. 4. Crush the cloves of garlic and place on top of asparagus. 5. Bake the asparagus at 400 degrees for 20 minutes. Make these right after putting the sweet potatoes in the oven and they will both be done around the same time! Grilling venison steak is basically the same as grilling a beef steak. The cook time depends on how thick your steaks are and how done you want them. You will want to grill your venison on high no matter the size! This will help cook the outside quickly, sealing in the juices and keeping the meat nice and moist. If you have a ¾ inch thick venison steak, cook for about four to five minutes per side. If you have a 1½ inch thick steak, you will want to cook it for about six to seven minutes per side. The best part about steak is that you can season it with whatever seasoning you want, allowing you to make it fit your favorite flavors! Even a little salt, pepper, and lemon juice could make the perfect steak taste. On a side note, I use venison because it has less fat than beef steaks. It also has fewer calories, more vitamins, and is healthier in general! Plus, it is delicious, especially with these tasty side dishes! This dinner is one that even my 2-year-old loves, making it an easy and healthy option when you don’t want to spend hours cooking. This meal took me 30 minutes to make and have on the table. The cleaning is the worse part!